You may also schedule follow-up appointments or request a reminder to be sent when it is time for your next cleaning. We require all of our patients to have their new patient forms completed 24 hours before their appointment. 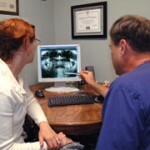 This enables us to prepare for your appointment and get started in a timely manner. Please have your insurance card available when you come in. If you can provide us with your insurance information ahead of time over the phone that would be even better. We would like to make it a little easier for you to complete all of your treatment by providing financing options through CareCredit. We offer interest-free six-month dental payment plans (4% processing fee applies). Longer payment plan options are available-ask our staff for details. We also accept Visa, Mastercard, Discover, checks and bankcards. Dental insurance can help make the best dental care more affordable to you. If you have dental insurance, we can help you get the most out of your dental insurance benefits by preparing and electronically filing the necessary forms for you. Not all dental plans are the same. Premiums and benefits can vary widely between different carriers and different plans. Be careful to fully understand the depth and limitations of your insurance plan. Dr. Landgraf is always willing to discuss his diagnosis and treatment plan with you, and the staff at Florissant Dental Services has years of experience with submitting dental claims, to help you understand your insurance coverage. Our primary concern at Florissant Dental Services is your overall health. The best insurance is always regular brushing and flossing, coupled with scheduled cleanings, to protect your smile from cavities and disease. Call (314) 207-3989 for details about your insurance, or to schedule an appointment.